Oh, my! This was a hard post to write! I had a really hard time staying down off my soapbox on the subject of our cultural attitude towards drawing, and art-making in general. But wait, why add images, anyway? The kinds of insights and understanding you glean from words and images are quite different. Think about the last time you we following instructions for assembling something. Isn’t it a lot easier to have both words and pictures? So, if you’re trying to gain insight and stimulate creative, flexible thinking it makes sense to use both words and images in your journal. But, what if your illustration of Stuck-Up Giraffe comes out looking more like a big-eared snake grafted onto a dachshund? Ha! You call THAT a giraffe! Even if no one else is ever going to see it, you might find yourself saying, “Wow! That is one stupid-looking giraffe! I can’t draw! What am I thinking, keeping a ‘creative’ journal? I obviously have ZERO talent!”? That’s probably not going to make you feel like loosening up and letting go, is it? One way or another, we need to deal with that reaction. In this post I’m going to give you several techniques you can use to add images to your journal, even if you can’t draw (or just don’t feel like it right now). But, I hope one possibility you’ll at least consider is throwing caution to the winds and drawing “badly”! Why? I know you probably think I’m going to say it’s good practice, but the real reason is . . . Sometimes a “bad” drawing is the right drawing! To be honest, I like that my illustration of Stuck-Up Giraffe came out looking like a big-eared snake grafted onto a dachshund. It makes me giggle. That’s a great way for me to loosen up and get into a creative, anything-goes mindset. Can you imagine launching into super-serious self-important psychobabble with that at the top of the page? If you feel the same way, then by all means, go with the giggle! But if you feel discouraged and embarrassed every time you try to draw something realistically here are some tools for getting images into your journal that don’t require any drawing ability (and may also help you develop yours, if you feel it’s lacking). First find out what it really looks like! You can probably recognize a giraffe when you see one. 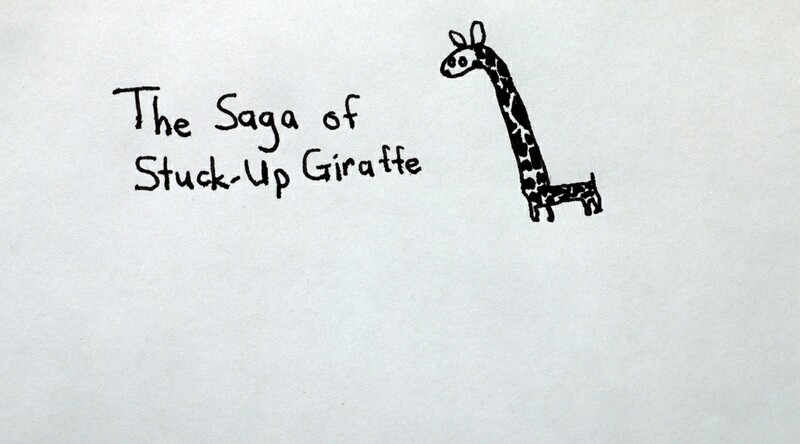 You might be tempted to assume that this means you should be able to draw a giraffe accurately. If you can’t . . . well, that just goes to show that you “can’t draw”. Have you seen the painting of Normal Rockwell painting a self-portrait? Why is he using a mirror? Because we really don’t (with some very rare exceptions) store all the details of even very familiar images like our own faces. We just file away enough to recognize things. If you wanted to add an image of a peony, and you had one blooming in your yard, you’d probably be able to come up with the idea of taking a photo and gluing it in without my help. But, you probably don’t have a pet giraffe. If giraffes are very significant for you, maybe you’d make a trip to the zoo. But what if this is just a quickie exercise and you have no particular attachment to giraffes? Luckily, we live in the age of the Internet, where there are about a gazillion images of anything you can possibly name. Those of you who have been in my classes know that I take intellectual property rights very seriously. (I do make my living as an artist, after all!) But this is your private journal, not your homework or something you’re going to use commercially. Nevertheless, to be squeaky-clean on intellectual property rights, check out the one of the many websites with free stock images (such as Shutterstock). Generally, the free version has a watermark across the image and/or is low-resolution, but neither is a problem for our purposes. We just want to know more about what a giraffe looks like. Or, go to Flickr and after searching for the subject you are interested in, use the “License” drop-down menu at the top of the page of results to restrict to images with Creative Commons licenses. Even the least liberal Creative Commons license would allow you to use the image in your private journal. Okay, now you have some idea what the thing looks like. What next? Look for a Creative Seed that already looks a bit like the thing you are illustrating, and embellish it. When it was time to write down my “Just-So” Story of How Bumblebee got his stripes, I happened to see a Creative Seed in my journal that looked like a bug splat. This “inkblot” Creative Seed looked like a bug splat to me. I turned my “inkblot” Creative Seed into Bumblebee right after he splatted into the fence and got his stripes. Then I wrote down his story around and on top of the image. I added some eyes, veining in the wings and a striped abdomen, and it was perfect! Then I wrote the story in colored ink all around in and on top of it. Even if you don’t find a Creative Seed that looks like the image you want to add, you may find one that is a great background or context for it. I almost always look to see if I can start with an existing Creative Seed. It really helps me get started! Cartoons, stick figures, and geometric critters. Think of petroglyphs (images carved on stone) or stylized images in needlework, pottery, jewelry or computer icons. Sometimes a simplified image is exactly what you need. A cartoon bee I used to illustrate another story about Bumblebee. Look at several images of giraffes (or whatever). What are the main features that say “giraffe” to you? Long neck, long legs, knobby horns, funny tail and knobby knees, perhaps. Then maybe a stick figure with those features is all you need. If a stick figure is too spindly (perhaps you’re drawing a whale! ), then trying to reduce the image to a series of geometric shapes (triangles, circles, ovals, rectangles, trapezoids) might work better. If precise shapes really appeal to you, you can use a ruler, compass and/or geometric templates found in the drafting supply section of office supply stores to make neat geometric figures. Or perhaps now that you have reminded yourself of the features that say “giraffe” to you, you’ll be able to come up with a cartoon version that satisfies you. Stick figure, geometric and cartoon giraffes. If a giraffe has come up in a story or dream, reflecting on the characteristics you associate with “giraffe” can also help you figure out what meaning it has for you as a symbol. So a simplified drawing may actually be a more powerful symbol that a realistic one. Challenge yourself to make your image out of fingerprints and/or brushprints, embellished with a bit of drawing. A brushprint is not the same thing as pushing paint around with the brush. No fair using the brush (or your finger) to “color in” an area! Press it down and lift, smush or stab with it, splay out the brush hairs and flick it, or make one single stroke. Like Japanese sumi-e painting, see how few marks you can use to make a critter, plant or other image. I dipped my finger in yellow paint and pressed it down on the page. Then I did it twice more, using a little less pressure each time. Then I dipped my brush is some pale grey paint and pressed it down on the page to make the wings. I dropped in some black for stripe and body color while the paint was wet, then added a few ink lines to finish my fingerprint bee. The dark line underneath was an accident, but I’ll probably turn it into part of the fence in the story. Suggesting this in one of my art classes invariably provokes a scandalized reaction. People seem to think this ranks right up there with copying your book report straight out of CliffsNotes. I’m not sure where this notion comes from, because every artist I know uses some sort of method for getting proportions and angles right. It might look like the artist “just draws”, but believe me, if they’re drawing realistically, they’re doing a lot of things that are just as mechanical as tracing. And plenty of painters start off by tracing either a photo or a drawing to position the main elements of the image before they start painting. Tracing can actually help you become better at drawing freehand. It develops eye-hand coordination and strengthens powers of observation. Plus, if you trace the same subject repeatedly (not the same photo), you’ll be absorbing the characteristic shapes and proportions of the subject. Eventually, you won’t need a reference photo at all. You’ll understand how the animal, or flower or tree or whatever, is made. If your journal has thin enough paper, you may be able to use a lightbox or sunny window to trace. Often, though, this is difficult with a photograph, even with very thin paper. A better way is to use some sort of transfer paper. We used to all have access to carbon paper, but that’s hard to find these days. Fortunately, you can easily turn your photo into transfer paper. You will need a photo you can write on, so if you’re tranferring a family photo, scan it or take a photo (or take it to a copy shop) and work from a copy. Print or copy it on inexpensive plain paper, not photo paper! On the back of the copy, scribble with a pencil or crayon all over the portion of the photo you want to transfer. It can be fun to use several different colors of crayon to get a multi-colored outline. Scribble all over with a pencil. Or, scribble with a crayon, or several crayons. Then place the photo image-side up over the page where you want to transfer your image. Using a ball-point or gel pen, trace the image. You’ll want to bear down fairly hard. Trace the image, pressing hard. Or, draw freehand over a crayon scribble to make a multi-colored line. The resulting image may be somewhat faint but you can easily go back over the lines to darken it. Or embellish it with color, or doodle-patterns, or further details added freehand. The traced image. You could obviously trace a lot more detail, if you wanted. A multi-colored line from tracing or drawing over a multi-colored crayon scribble. Cut it out and collage it (glue it in). This doesn’t really require a lot of explanation. Cut out the parts of the image you want to include and glue it into your journal. If you are planning to draw on top of the image with markers or non-permanent ink, you may wish to avoid getting glue on the front. However, I find that I get a more durable bond, if I spread glue on the journal page, place the image and then spread a layer of glue on top as well. Then, while the glue is still quite wet, I smooth off the excess with a paper towel. I put glue under and on top of my collaged pieces to help secure them. Wipe off excess glue with a paper towel. Be sure to do it before the glue gets too sticky! After I glue in an image, I still usually embellish it in some way. I may enhance the color with some permanent markers, or doodle a border around it or draw a context for it (maybe just a line to represent the ground). I use acrylic matte medium as my all-purpose white glue. As its name implies, it dries with a matte finish, so it is possible to draw or write on it with colored pencil, permanent marker or crayon. Watercolor beads up, but you can paint over it with acrylic paint. This is a little more involved, but it’s fun to try and give an interesting “distressed” look. You’ll need access to an inkjet printer. It works best with a fresh print where the ink hasn’t dried too long. How well this technique works depends on the type of paper you have in your journal (needs to stand up to being wet fairly well), the type of paper you print on (better if the ink doesn’t stick too well!) and the type of glue you use. I’ve had the best success using acrylic gel medium as my glue, but I’ve also done it with a lot of different acrylic mediums as well as white household glues (e.g. Elmer’s) or non-washable bookbinding or school glues. You are going to be re-wetting the glue, so a washable school glue is not a good choice for this technique! NOTE: Your image will be REVERSED with this process, so you may want to print out a reversed image to get it transferred the way you want. Liberally apply acrylic medium or white glue to the page where you want to transfer the image. Liberally apply acrylic medium or glue to your journal page. Place the image FACE DOWN on the wet glue. Rub all over the back with something smooth, like the back of a spoon, a burnishing tool or a bone folder. Place the image face down and burnish the back the back of a spoon, a bone folder or similar smooth rounded tool. Re-wet the paper and use your fingers or a household sponge to gently rub the paper away from the image. Most of the ink will have transferred into the glue, leaving the image behind as you remove the paper. Wet the paper and gently rub the paper free, leaving the ink embedded in the dried glue. You may have to re-wet areas more than once to get all the paper off. But, be careful! If you get the underlying journal page too wet, you may wind up peeling the glue off the page instead. If that happens in a few areas, don’t be concerned. I have found that brushing another layer of glue on top can help make any remaining bits of paper more transparent. Brush more glue on top to make the image more transparent and bring up the colors. Part of the beauty of this method is that it doesn’t usually result in a complete transfer. Again, I usually go in and add color, or otherwise embellish my images and connect them to the surrounding journal page. Here, I’ve gone in with colored pencil to give the image more of the look of a drawing. Golden Artist Colors (my favorite paint manufacturer) has a more detailed explanation of this technique, complete with videos, on their website. Remember, it’s about insight and creativity! I hope this gives you some ideas for adding images, even if you feel you can’t draw. In later posts, I’ll also say give you some tips for learning to draw realistically, if that’s an interest of yours. But I hope you will not let lack of drawing experience rob you of the fun and insight that images and symbols can add to your Creative Energy Journal. Dreams, reveries, play, stories, myths, song and poetry are the realms of intuition and creativity. Allow your images to be the primitive, dream-like, symbolic and playful inhabits of those realms, so they can speak to you personally and powerfully.